When the season changes, it’s easy for me to get excited about using sweet potatoes, butternut squash, and greens. But fall produce is so wide and varied and lately, I’ve been getting excited about the items that often go ignored. 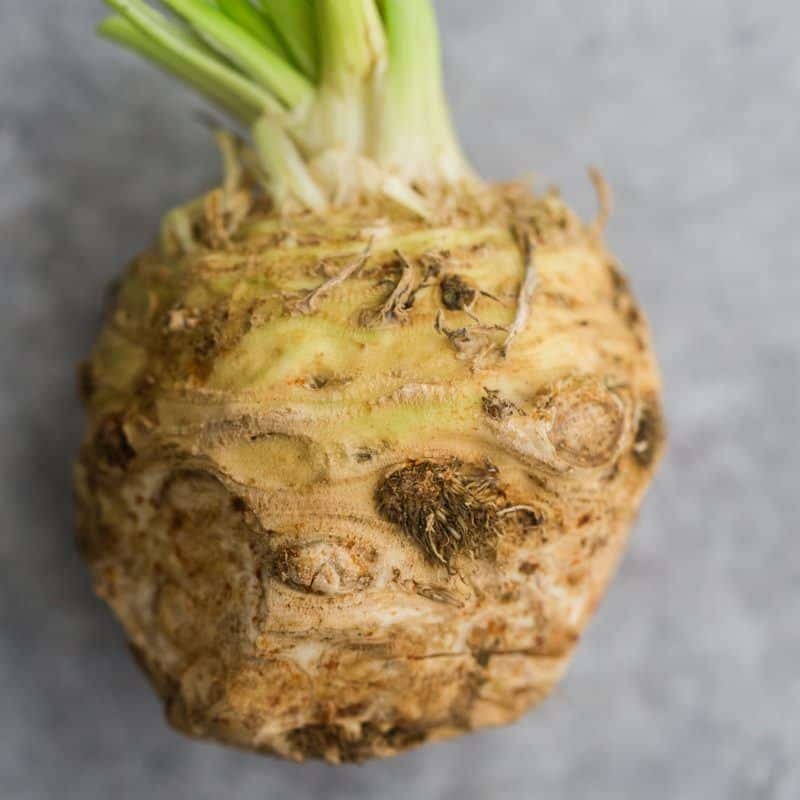 If you’re not familiar with celeriac (or celery root), it’s a gnarly looking vegetable. The taste is earthy with hints of the celery flavor you might expect from celery stalks. 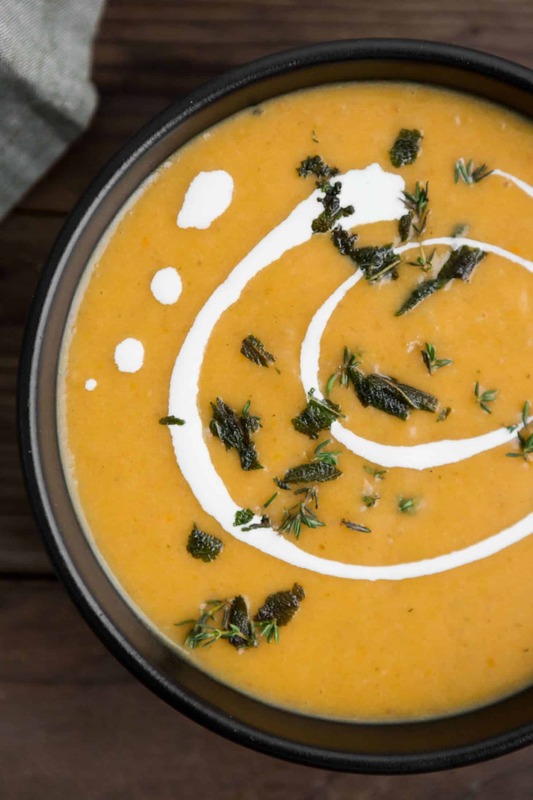 This celeriac soup is well balanced in flavor thanks to potatoes, carrots and fresh thyme. Best of all, it’s creamy and delicious without any cream in the soup (the drizzle is optional)! 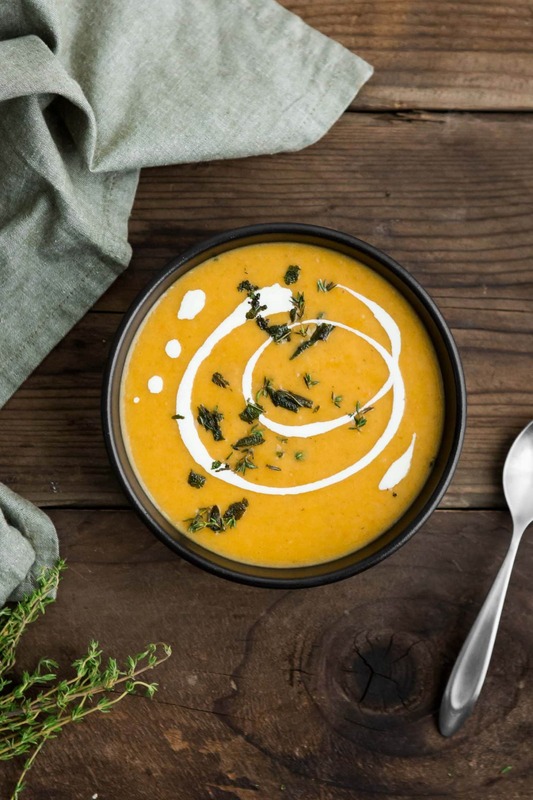 This celeriac soup is a great way to jump into using a slightly funky looking root vegetable. The end result, however, is a beautiful creamy soup ready for fall. Cut off skin and roots of celeriac. Dice celeriac, carrots, and potatoes into 1/2 inch cubes. Place on a baking sheet or in roasting pan. Roughly mince shallot and garlic. Add to dice vegetables. Drizzle with olive oil and sprinkle with salt. Toss until all the vegetables are well coated. Roast in the oven 35 to 40 minutes or until the vegetables are beginning to caramelize and brown. While vegetables are roasting, heat 2 tablespoons olive oil over medium-high heat until hot. Fry sage, 3 to 4 leaves at a time until crisp. Remove from heat and set aside. When vegetables are done roasting, transfer them into a blender. Add thyme leaves from 5 sprigs into blender with 3 1/2 cups vegetable broth. Puree until smooth. Add more vegetable broth to achieve the consistency you desire. Transfer soup to a medium pot. Bring to boil over medium heat. Serve with crispy sage, extra thyme and a drizzle of heavy cream. Tips & Tricks: Be sure to wash and peel celeriac before using it in any recipe. If you are using an immersion blender or regular blender (not high speed), be sure to peel the potatoes before roasting to achieve a smooth consistency in the soup. The soup consistency is on the thicker side. After pureeing, add more broth if desired to get a thinner soup. One of the things I love most about fall produce is the ability to swap vegetables for whatever you might have on hand. I highly suggest keeping the celeriac but the carrots and potatoes have a few other options. You can also play around with the consistency by adjusting the amount of broth you use. I prefer my soups on the slightly thinner side, which means I’ll occasionally strain through a sieve. Or you can keep the texture thicker and more stew-like. Herbs: Swap out the herbs in the recipe. Try finishing the soup with fresh dill and parsley. 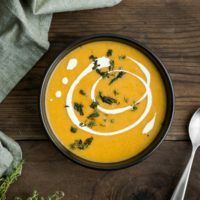 Root Vegetables: This celeriac soup would also be good with parsnips and sweet potatoes instead of carrots and potatoes. Celery: Can’t find celeriac? Use 2 ribs of celery instead. It will give you a slightly different flavor but will be just as delicious. I’m dedicating October to root vegetables and I’m excited to kick it off a bit early with this soup. Celeriac can look intimidating but it’s definitely a root that deserves more attention. While it’s not meant for every recipe, it’s quite enjoyable in soups, salads, and heartier dishes as we move into cooler weather. Look for celeriac that has some weight to it when you pick it up. 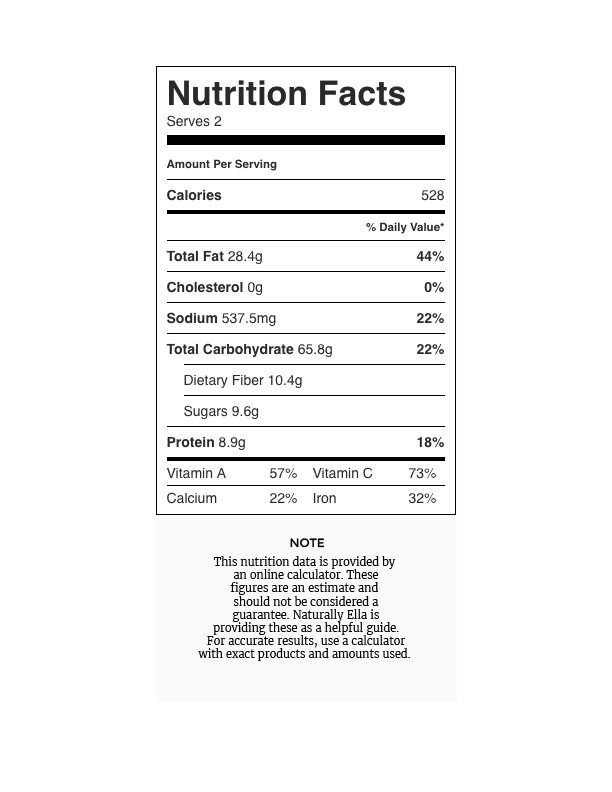 If it feels light, most likely it’s older and the flavor will not be as good. I was just looking for something for dinner tonight. I think a stop at the store for some celeriac is in order! My celeriac is so hard that I can’t peel it. Should I roast it awhile first, and then peel and cut it?